Kitab fi Al Jadari wa Al Hasaba authored by the Muslim physician Abu Bakr Muhammad ibn Zakariya al-Razi (d. ca. 925) is one of the books that remained popular and in great demand for over a millennium, and was also repeatedly translated into many languages. This Treatise on Smallpox and Measles was the first comprehensive text on this disease. In the following short note, Dr. Nasim Hasan Naqvi presents this text, its main contents and its historical context. This article was first published in The Historical Medicine Equipment Society Bulletin No 22 August 2009. We are grateful to the author for allowing publication. Not many books remained popular and in great demand for over a millennium, and also repeatedly translated into many languages for institutions of higher education. 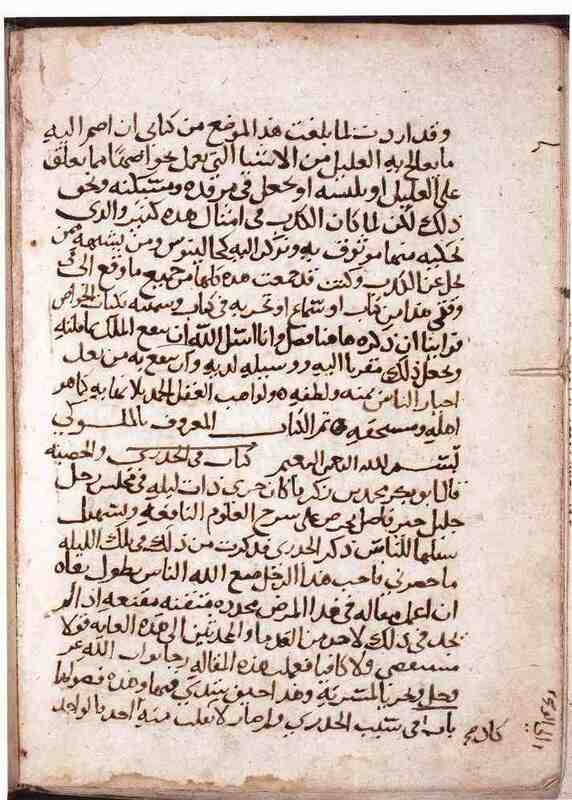 One such manuscript was written at the end of 9th century CE by a brilliant polymath, Abu Bakr Muhammad ibn Zakariya al-Razi (865- ca. 925) or Rhazes (in Latin) who contributed to medicine, philosophy, mathematics and music. To quote F. H. Garrison, "Rhazes, a great clinician, ranks with Hippocrates, Areteaus and Sydenham" . His treatise on smallpox and measles was the first authentic account of this disease, remaining in print till the middle of the 19th century. Figure 1: First page of the Arabic manuscript of Kitab fi al-Jadari wa-‘l-Hasaba. Source: The Leiden University Library. The earliest epidemics of smallpox have been reported from the banks of the Nile, from where it spread to the Middle East, Europe and Asia. Since then, smallpox has devastated populations until its eradication in 1977. Surprisingly, despite the havoc it caused, very little was recorded in medical literature and it is absent in medical papyri . The plague of Athens of 430 BCE is said to have been due to smallpox but Greek medical texts do not discuss it as a disease, thus Galen made only passing mention to smallpox, nor was it discussed by the Chinese. Three Indian medical texts contain only minimal and identical descriptions of a condition Masurica (when pustules like brown lentils appear), translated as Variola, that is smallpox . Similar interpretations are made by better informed historians . Some are of the view that Masurika was not smallpox but chickenpox and that early Indian medical texts did not describe smallpox as it was not prevalent in India till 12th century CE. However, this is unacceptable for everywhere else smallpox and chickenpox existed side by side; moreover, trade links existed via the Silk Road and sea routes with India and Egypt, Mesopotamia, Greece, the Roman Empire and China where smallpox was endemic. With huge movements of human and animals taking place for thousands of years, it is against logic that India remained free of this highly contagious disease. 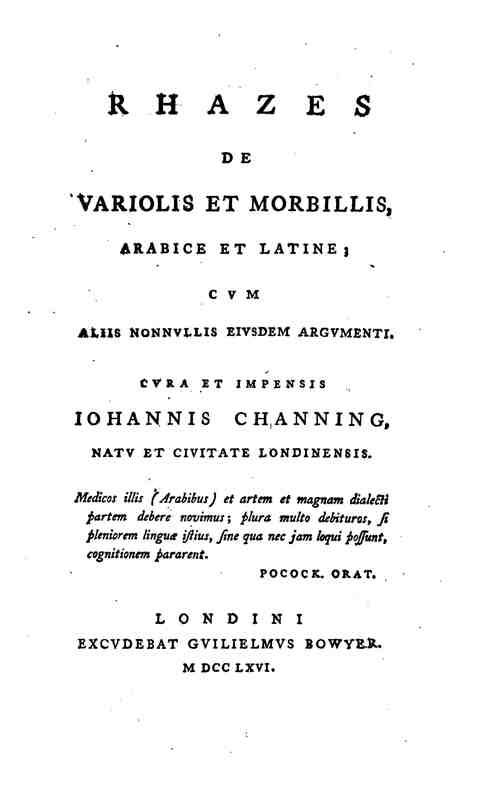 Figure 2: Front cover of Channing's modern edition of Al-Razi's treatise in Arabic and Latin Maqāla fī al-jadarī wa al-hasbah (Liber de variolis et morbilis): an eighteenth century Arabic manuscript of Rhazes' treatise on smallpox and measles, with a Latin translation by Salomon Negri, a Melkite priest from Damascus (London, 1766). Glasgow University Library, Special Collections Department, MS Hunter 133. (Source). Smallpox was first documented in a Syriac medical text by Ahrun of Alexandria in 622 CE, but Rhazes wrote the first comprehensive text, its translations remaining in print till the middle of the 19th century. The Arabic title of the book is Kitab fi al-Jadari wa-‘l-Hasaba, translated into Latin as Variolis et Morbillis and into English as A Treatise on Smallpox and Measles. In his introduction Rhazes stated when meeting other medical men, a discussion on smallpox took place and, after he had explained his views, he was asked to write a full description. He noted that Galen only mentioned smallpox briefly and referred to the Arabic translator of the Syriac of Ahrun of Alexandria without mentioning the book itself. In one chapter, he differentiated smallpox from measles and also observed that survivors of smallpox never suffer again. Figure 3: On-line publication of al-Razi's Kitab fi 'l-jadari on the website of the American University of Beirut, Lebanon (p. 1). 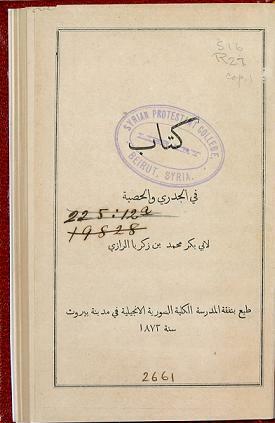 The book was edited in Arabic: Kitab fi al-jadari wa al-hasaba li-Abi Bakr Muhammad Zakariya al-Razi. Printed at the expense of the Syrian Evangelical College of the city of Beirut, 1872. (Source). Although the book was translated into numerous languages and copies of these are found in collections and libraries, there are only two original Arabic manuscripts. One is in the Leiden University Library (Fig. 1) and the other in the National Library in Venice, both being donated nearly 400 years ago . That in Leiden has been used by translators and researchers but the other in Venice has not seen the light of day for centuries. Rhazes's book remained in great demand until about the middle of the 19th century, being the only book available on smallpox. It was first translated into Greek and subsequently nearly 40 times into almost every European language. It was first translated into English from a Greek text by Mead in 1747 and published in London, followed by two more translations in 1756 and 1762 with reprints in Edinburgh. London and Dublin. A popular translation by the famous London Apothecary John Channing (died 1780) was published in 1766. This was a Latin translation with the Arabic on opposite pages (fig. 3-4). The last English translation by Greenhill in 1848 is said to be the best; because it was translated direct from the rare original Arabic manuscript borrowed from the Leiden University Library ; it was last reprinted in 1875. An Arabic version was published in 1872 in Beirut. 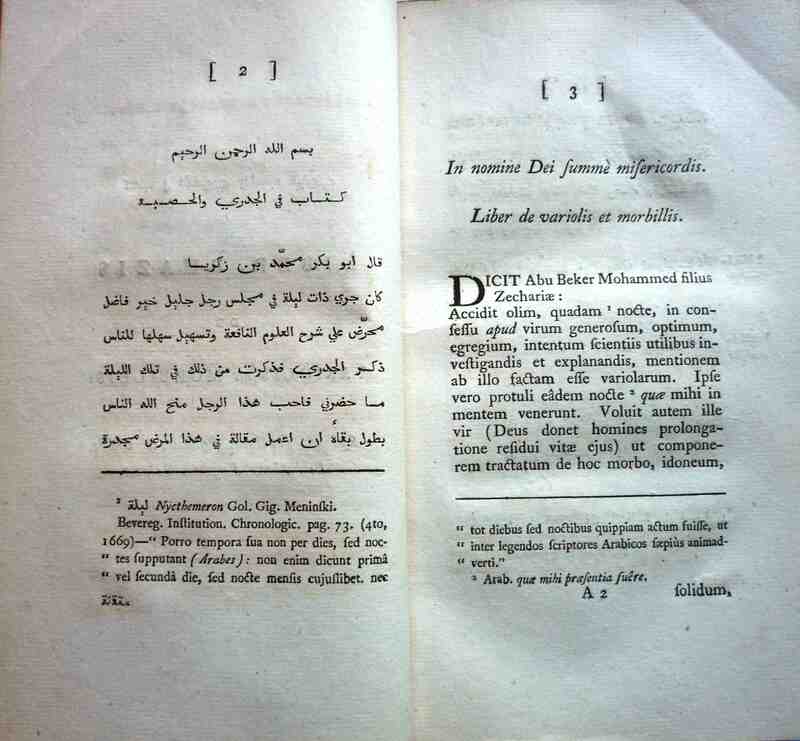 Figure 4: Pages 42-43 from Channing's edition of Al-Razi's treatise (London 1766). Nizar Souayah, MD; and Dr Jeffrey I. Greenstein, Insights into Neurologic Localization by Al-Razi (Rhazes), a Medieval Islamic Physician (published 20 January 2011). Rabie E. Abdel-Halim, Paediatric Urology 1000 Years Ago (published 13 May 2009). FSTC Research Team Medical Sciences in the Islamic Civilization: Scholars, Fields of Expertise and Institutions (published 2 February 2009). Salim T S Al-Hassani and Mohammed Abattouy, The Advent of Scientific Chemistry (published 22 October 2008). Abdul Nasser Kaadan, Al-Razi on Smallpox and Measles (published 8 April 2007). FSTC Research Team, Al-Razi the Medical Scholar (published 11 May 2005 ). FSTC Research Team From Alchemy to Chemistry (18 May 2006). Rhazes, The Spiritual Physick of Rhazes, translated by A. J. Arberry in the "Wisdom of the East" Series (London: John Murray, 1950). Rhazes (al-Razi). A Treatise on the Smallpox and Measles, translated by W A Greenhill. (London: Sydenham Society, 1848; reprinted in Baltimore: Williams & Wilkins, 1939). E Savage-Smith, ‘Medicine', in R. Rashed (ed. ), Encyclopedia of the History of Arabic Science, (London and New York: Routledge, 1996), pp. 903-962. O Timkin, 'A medieval translation of Rhazes' clinical observations', Bulletin of the History of Medicine, 12 (1942), pp. 102-117. Garrison, FH., An Introduction to the History of Medicine (Philadelphia & London: Saunders, 1929), 129. Nunn, JF., Ancient Egyptian Medicine (London: British Museum Press, 1996) 77. Bhishagratna, KK., tr. Susruta Samhita (Varanasi: Chowkhamba Sankrit Series Office, 1981) 90. Keswani, NFL, The medical vision of India http://www.healthlibrary.com/book17-chapter108.htm. Greenhill, WA., Smallpox and Measles (London: Sydenham Society, 1848). * FRCA, Consultant Anaesthetist, Bolton General Hospital, Bolton.